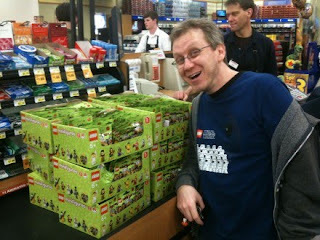 Hillel Jeff and Daniel score 11 cases of Series 3 minifigures on the first day they exist. At 25 % off. You do not have to wait till Jan 2011, from the latest update these figures are now avaliable for sale in US. It will be appearing on ebay within a week or so. There isn't any barcode on the package. So collectors who want to collect 'em all, will need to buy a whole box and I presume the resell price will be more expensive & subjected to speculation in Singapore. At the moment, I don't have any news as to when it will arrive on our island. Hello from Singapore! An AFOL, i received my first lego set from Japan in 1980. Lego Corner Candy and City Post & Library MOC Order today! LEGO® is a trademark of the LEGO Group of companies. Copyright © 2010 Lego Asia.All rights reserved. Picture Window theme. Powered by Blogger.